Insulation Plastics' Value-Added Services Department specializes in providing several customized services including cut pieces, special packaging, custom labels, thermal printing and hot stamping. Whether you require low volume personalization or high volume standardization, we will provide you with the finest quality product based on your specific requirements. Please contact us with your requirements and let us start saving you time and money – no job is too small for us. Our high speed cutting machines can cut pieces to your tolerances, from a few hundred pieces to several hundred thousand. 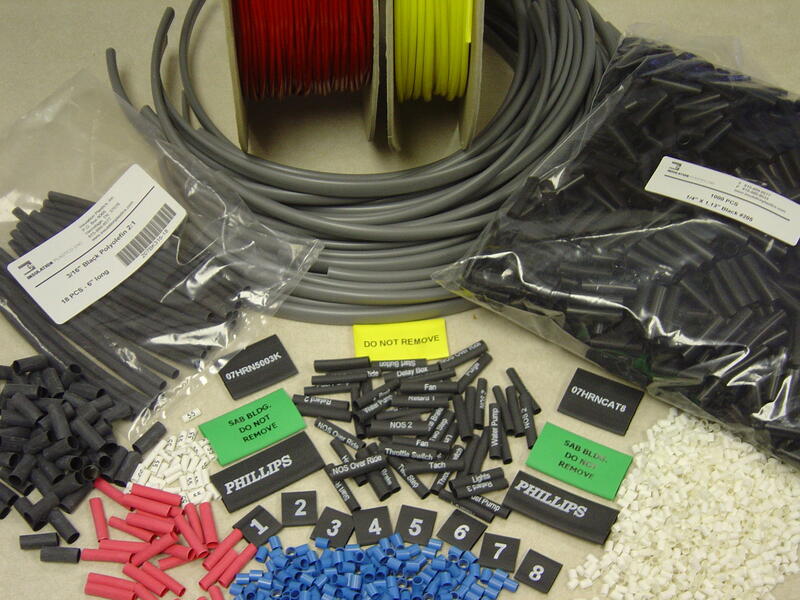 Custom hot stamp and thermal printed heat shrink tubing for wire marking. We can even print graphics. Let us package the material to your specifications. Material can be provided on spools ranging from several feet to 1000 feet. Continuous lengths are available. With our high speed cutting equipment we can provide you the exact short or long lengths you need for assembly. We will give you smooth cuts, square ends, close tolerances and exactly the quantity you need. Our experience cutting millions of pieces in a variety of heat shrink, extruded tubing, and sleeving materials can help you obtain better quality at a lower cost. The cost of tubing cut to your specific lengths is very economical and saves you the higher cost and effort of doing it in-house. You can find a table of our standard cut tolerances here. Our state-of-the-art equipment economically produces custom thermal transfer and hot-stamped polyolefin heat shrink wire markers. We can provide generic printed samples, as well as work up customer specific samples at no charge. Just let us know what need and we will work with you to produce printed markers to your specifications. We can also print on some of our sleeving products and lay-flat PVC heat shrink using pad printing, wheel printing and flexographic printing techniques. Contact us for pricing and samples. Custom packaging and labeling is available on all our products. We can provide our products packaged the way you need it. Whether you require bags of a few hundred pieces or several hundred thousand pieces, we can provide just what you need. Labels can be printed to your specifications including your name, logo, address, bar-codes, date code, and part number. We can also package products to meet specific assembly, inventory control, distributor, and point-of-sale requirements.